As executive director, Katie oversees the firm’s finance, information technology, marketing and business development, human resources and administrative functions. She also assists with developing and implementing the firm’s strategic plans. Prior to joining Gavin Law Offices, she held a position in operational management. 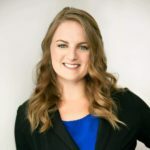 Katie is involved in the Richmond business community and currently serves as the National Association of Women Business Owners (NAWBO) Richmond Chapter, Foundation Board President.